The vacancies may increase or decrease in numbers and categories. Reservation for the members of Scheduled Castes, Scheduled Tribes, Other Backward Classes and other categories of U.P. shall be such as may be specified by the Government Orders issued in this behalf from time to time and as adopted by the High Court. The link for submission of Online Application Form will remain active from 06.12.2018 to 26.12.2018. 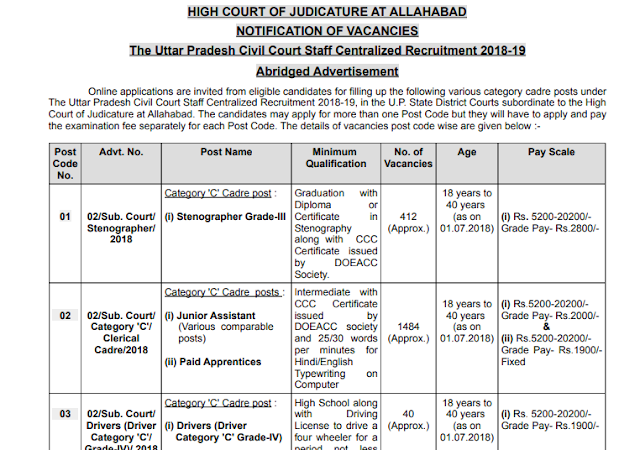 The High Court, Allahabad will hold common offline Written Examination (on O.M.R. Sheet) Post Code No. wise on different dates/shifts in the various Districts of Uttar Pradesh, followed by Hindi/English Computer Type Test, Hindi/English Stenography Test and Technical Driving Test wherever applicable. The information regarding Date, Time and Venue of the Examinations/Tests shall be intimated to the candidates through e-admit cards later on.